Removing old linoleum can be difficult and messy. Making matters worse, some old linoleum contains asbestos, and disturbing it can lead to dangerous exposure. What to do? Instead of worrying, you can simply install new plywood over the linoleum, then follow up with the floor finishes of your choice. Here’s how to quickly and easily go about installing plywood over linoleum. 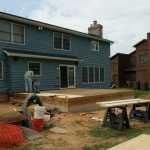 Before you get started, you’ll need to do just a little prep work to determine what kind of materials you will need to purchase for your project. Begin by removing the baseboards. Be careful, particularly if you plan to clean them up and put them back in place. By the way – if you’ve been thinking about refinishing your baseboards, now is a good time to do it. You can quickly and easily refresh them with new paint or stain. 1. Once the baseboards have been removed, lift a corner of the linoleum to see what’s underneath. If the linoleum is glued to a plywood subfloor, you’ll want to install the plywood over the linoleum with deck screws. If it’s over concrete, you will need concrete screws. 2. Scrub the linoleum floor well to remove any grease. 3. Sand the linoleum with 120-grit sandpaper, taking the necessary health precautions. 4. Measure the room if you haven’t already, so you know how much plywood to purchase. 5. Find the longest wall in the room. The farthest corner from the doorway along this wall will be used as your starting point for installing the plywood over the linoleum. 6. Apply a thin layer of construction adhesive to the back of the plywood. 7. Set the plywood into place. 8. Using the appropriate screws for the floor beneath the linoleum, screw the plywood into place. Position the screws no further than 16 inches apart from one another. 9. Repeat steps 6 through 8 until you have installed the entire plywood floor. The linoleum floor, Danielle D.
Installing plywood over linoleum is a very simple, straightforward task. It’s easier and much neater than removing old linoleum. This being said, there are a few ways you can make the job even easier on yourself and get even better finished results so that your floor is smooth and ready for your choice of floor covering. • Consider how much height the new plywood floor will add to the room. 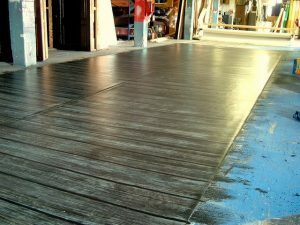 While ¾-inch plywood provides a very sturdy platform on which to install hardwood flooring, laminate, or new carpet, the combined height of the plywood and the new flooring can interfere with a door’s ability to open and close smoothly, plus you’ll need to build or buy a transition ramp to prevent tripping. • Consider using tongue and groove plywood. Your seams will be tight and your floor will be more stable. o ¼-inch exterior grade AC plywood is ideal for laying under vinyl flooring of various types. o ¼ to ½-inch exterior grade plywood works perfectly under hardwood floors. o ½-inch AC exterior grade plywood can be used as a replacement for fibercement board or cement board under ceramic tile. • If you need to cut your plywood to fit into tight spots, you’ll find it is easiest to accomplish with a circular saw. • Leave ¼” of space along the walls to allow for expansion.